After a brief hours-long government shutdown in the middle of the night, the House and Senate both voted to pass a budget deal that sets military and nonmilitary spending levels for 2018 and 2019. The deal sets 2018 spending levels at $700 billion for the military - including an $80 billion budget increase, as well as $71 billion in war and emergency funding, an increase over recent years. Nonmilitary discretionary spending was set at $591 billion for 2018. The resulting federal discretinary budgets invests 54% of the federal discretionary budget in the miltiary and nuclear weapons. Non-military spending includes federal funding for public education, veterans' care, the National Institutes of Health, Environmental Protection Agency, State Department and other programs means that the resulting balance. 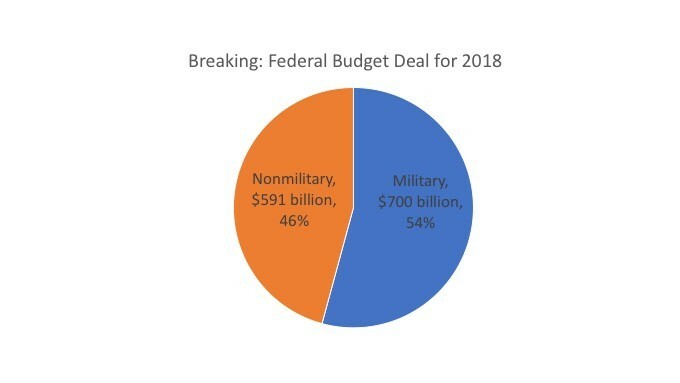 The president's budget proposal for 2018 would have shifted the balance of military and non-military spending, with a military budget making up 59% of federal spending. More details will be negotiated during the coming weeks, when both houses will again need to vote on the final budget deal. The bill passed by the House and Senate does not include any resolution to the humanitarian crisis for Dreamers resulting from the administration's end of the Deferred Action for Childhood Arrivals program.